Ervin signed a reserve/futures contract with the Ravens on Tuesday, freelance NFL writer Howard Balzer reports. Analysis: Ervin spent the last half of the 2018 season on Baltimore's practice squad and he'll now set his sights on an active roster spot in 2019. The young running back appeared in 25 games for Houston over the past three seasons but only had five rushes for 15 yards and 14 catches for 91 yards over that span. He'll have a shot at a depth slot with the Ravens next season. Ervin and the Ravens have agreed to a practice squad contract. Analysis: After Ervin saw minor action throughout the season with Houston, the team ultimately elected to cut ties with the 2014 fourth-round selection last week. 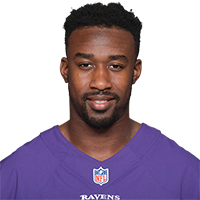 The Ravens -- who have questionable depth at the position -- didn't waste much time adding him to the practice squad. Ervin could join the active roster down the road if one of the depth backs underperforms or suffers an injury. 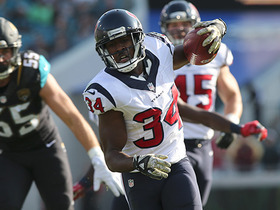 The Texans waived Ervin on Wednesday. Ervin played 10 snaps on offense and did not get a touch or a target in Sunday's 19-17 win over the Broncos. Analysis: Ervin had received a bump in playing time the previous two weeks at slot receiver, as Keke Coutee (hamstring) battled injury. With Coutee inactive Sunday, it looked like another opportunity for Ervin, but the Texans tilted heavily to the run -- Houston ran the ball 33 times compared to 24 pass attempts. That game plan meant a lot of two-tight end sets and put a cap on Ervin's appearances on offense. Ervin is expected to get increased snaps on offense after the Texans declared Keke Coutee (hamstring) out for Sunday's game against the Broncos. Ervin will be the likely replacement at slot receiver if Keke Coutee (hamstring) is unable to play or limited Sunday against the Broncos, Aaron Wilson of the Houston Chronicle reports. Analysis: Houston head coach Bill O'Brien sounded optimistic about Coutee, telling reporters Friday that he thinks the injured receiver has a chance to play and will possibly have him work out Saturday to see where he's at. Ervin filled in last week for Coutee, playing a season-high 35 snaps and catching his lone target. The addition of former Bronco Demaryius Thomas is also a factor in how much playing time Ervin sees Sunday. Ervin is expected to serve as the Texans' primary option at slot receiver Thursday against the Dolphins with Keke Coutee (hamstring) not expected to play, Aaron Wilson of the Houston Chronicle reports. Ervin ranks fifth in the NFL with 28.1 yards per kickoff return and 10th in the league with 10 yards per punt return through the Texans' first three games of the season. Analysis: Ervin is making an impact on special teams after missing 12 games in 2017 with a torn patellar tendon, but the third-year running back hasn't seen an offensive snap the last two weeks. The Texans may want to consider integrating him more on offensive after the running game was shut down by the Giants on Sunday. His ideal role is that of a change-of-pace back who can create matchup problems in space. Ervin averaged 31.2 yards on five kickoff returns, 10.0 yards on punt returns, and caught his lone target for 12 yards in Week 1's 27-20 loss to the Patriots. Analysis: Patriots kicker Stephen Gostkowski purposely made his kickoffs returnable and Ervin obliged, setting up the Texans with an average field position at their own 31-yard line. Houston's return game has not been very special over the last few years, but Ervin provided some hope in the season opener. Ervin is listed as the starting returner for kickoffs and punts Week 1 against the Patriots. Analysis: Ervin was challenged during the preseason for both jobs, mostly by the departed Troymaine Pope, but will reprise the role he held at the start of 2017. He lasted just four games in that role before tearing a patellar tendon and was shut down for the season. On offense, Ervin is the third running back behind Lamar Miller and Alfred Blue. Ervin is competing for a special-teams role as the main returner on kickoffs and punts, Aaron Wilson of the Houston Chronicle reports. Ervin (knee) was medically cleared for full-contact activities ahead of training camp, Aaron Wilson of the Houston Chronicle reports. Analysis: Ervin suffered a torn patellar tendon last October that required season-ending surgery. The 24-year-old has seen most of his snaps on special teams during his two seasons in the league, tallying 356 total yards on kickoff returns and 321 yards on punt returns. 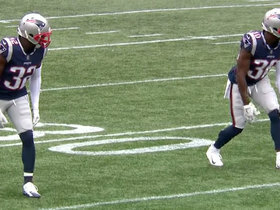 New England Patriots safety Devin McCourty and cornerback Jason McCourty become the first twin brothers to appear in a game together in 90 years. 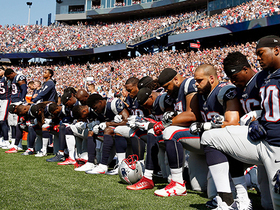 The New England Patriots and Houston Texans lock arms, kneel and stand together to show unity during the national anthem. 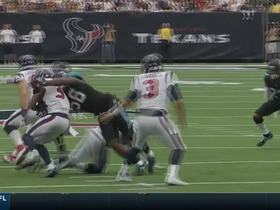 Jacksonville Jaguar defensive end Dante Fowler takes down Houston Texans running back Tyler Ervin for a loss of yards. 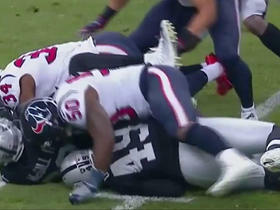 Houston Texans running back Tyler Ervin muffs a kick return and the Oakland Raiders recover. 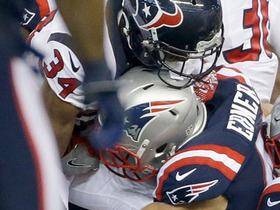 Houston Texans running back Tyler Ervin fumbles on the kick return, New England Patriots safety Jordan Richards recovers.